Effective January 2017, you will file and pay Glendale tax directly with the Arizona Department of Revenue. To do this, you will need a State of Arizona Department of Revenue Transaction Privilege and Use Tax license. If you do not have a State license, please visit aztaxes.gov to apply online. The last time we were at the stadium, we were told a City of Glendale license did not suffice, and the license was stadium specific. We have confirmed with the City of Glendale that, that information is no longer the case! 7. Fill out the form. Note: Name of the location is the venue! 8. Depending on the site's functionality at your time of applying, you may be required to pay the license fee online OR may be mailed a bill in the mail. For additional information from the Arizona Department of Revenue, click here. ? 's regarding this license? Please contact the Dept of Revenue directly. Hashtags are your friend! If you're looking to get more exposure to our thousands of followers - use our hashtag of #FPPVM when posting on your platforms. We tell our attendees to search this tag to find market preview photos! Hit the three little dots next to the Share button. 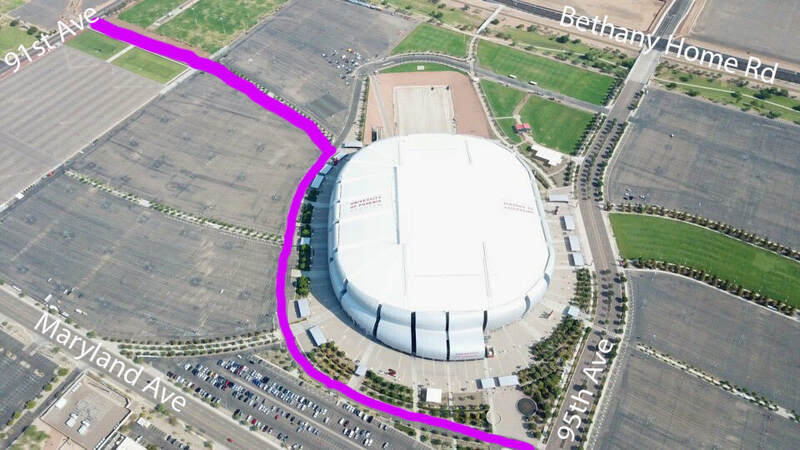 As this event is being held in the AZ Cardinals' home stadium, please remember that you cannot sell any AZ Cardinals items unless you have secured the proper licensing from the organization. They do not enforce compliance for the other NFL teams, but they 100% will on their own. At previous shows, they have pulled product from vendors who could not show proof of licensing. Please avoid this happening to you, and don't gamble by trying to bring such goods. As a reminder, if you were approved to sell a food product within your booth, it MUST be packaged as a take home food. NOTHING can be served for immediate consumption. This is strictly enforced by the stadium. TSE is the stadium contracted power provider. New to 2018, hardline internet access is the only option offered by the Cardinals Organization at the stadium. The price is $150 per device. 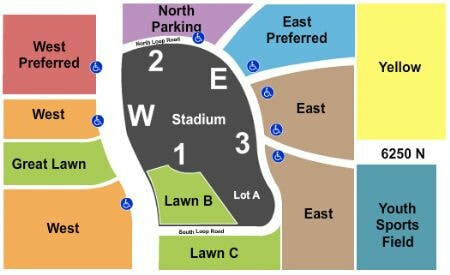 Orders can be placed on-site at the stadium during the event/load-in. Vendors are permitted to park in the East lots. A registration table will be set up at the entrance gate for the event. Please make sure to visit this to obtain your two wristbands from our staff which will allow you pre/post event access. 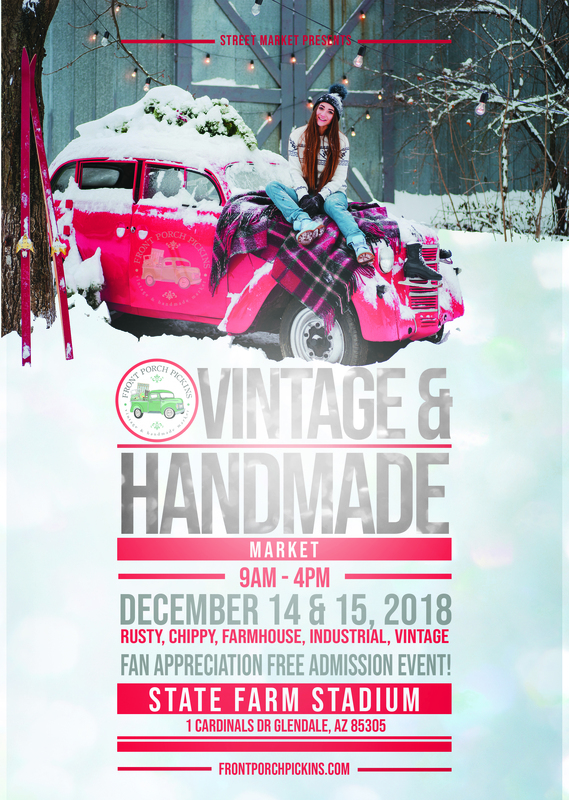 Friday 8AM-8:45AM (Open to public from 9AM-4PM) Vendors exit by 4:30PM. Saturday 8AM-8:45AM (Open to public from 9AM-4PM) Load out immediately follows the close of the event. You are NOT able to pull your car directly to your booth on the mezzanine. Please bring handcarts and dollies to transport your goods from your vehicle to your space. We will have supplemental staff support on site to help expedite the process. These staff members are not dedicated to a sole vendor's load in efforts. They will be going back and forth helping as many people as possible. 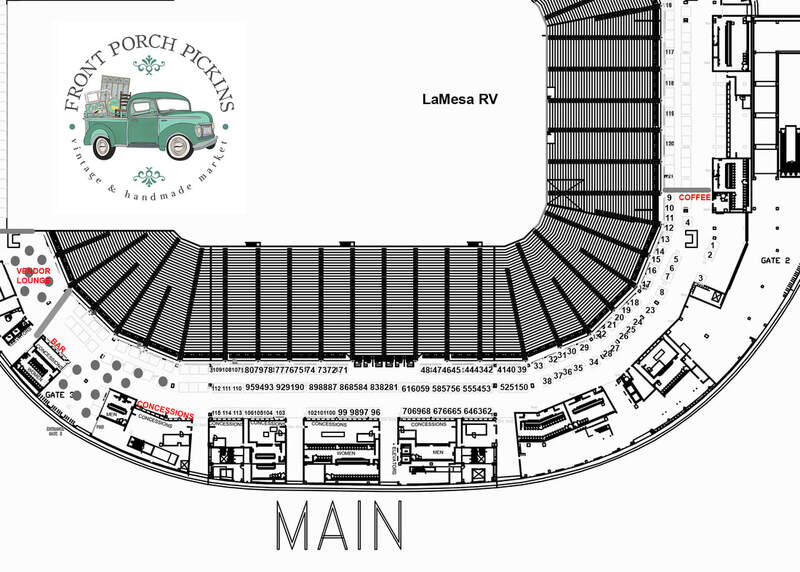 Vendors will enter off 91st Ave and unload on Loop Rd in front of Gate 3. There are two lanes: a park to unload lane and a drive lane. Please respect the staff directing traffic. They will do their best to keep everything flowing as quickly as possible. Vendors must pack up their smalls prior to loading their vehicles. **Vendors are NOT permitted to leave the event or break down early. Should you choose to do so, you will be disallowed from participating in any future Front Porch Pickins and Street Market event. We are adamant about this as we always want to have integrity in any promotions to customers and vendors. Overnight security is provided on Thursday & Friday night. No need to tear down your booth. Front Porch Pickins, nor Street Market, LLC is liable for the damage or theft of any goods. As this in an indoor event, you are not required to bring a canopy, but may bring one if you like. It must fit within your purchased booth space. Refearn your way to a FREE booth! Refer four new* vendors to FPP, who apply, mention your company name on their application, are approved to participate, and complete payment to an upcoming market. YOU will receive a FREE interior booth! Each referral secures you 25% off an interior booth. Want a double space- refer eight vendors, etc! *new vendors are defined as never applying to a Front Porch Pickins market before. 51 Gonga Breath Salsa and Dip Co.
As noted in the FAQ section of our website & on all invoices, all booth sales are final. No refunds, exchanges, or transfers are permitted for any reason.